Friday, January 18th, the first steps of the Blockbuster disassembly began at the Port of Rotterdam. The main boom was first to be removed with the help of two on-site cranes. After several other components of the heavily modified E-Crane were disassembled, pieces of the Blockbuster were loaded for transport. This unique E-Crane, which built the hard sea defense at Maasvlakte 2, will soon get a second life in the Caspian Sea. On Monday, January 28, the disassembly continued. The cylinders, each weighing about 4 tons, were next to be removed. The next steps – disassembling the counterweight and catwalk platforms – started on Tuesday. After the whole undercarriage is disassembled, the E-Crane will start a new journey on a pontoon through the canal of Yangtze, which provides access for ships to enter Maasvlakte 2. In order to transport the giant E-Crane, it was important that the canal was deepened enough. 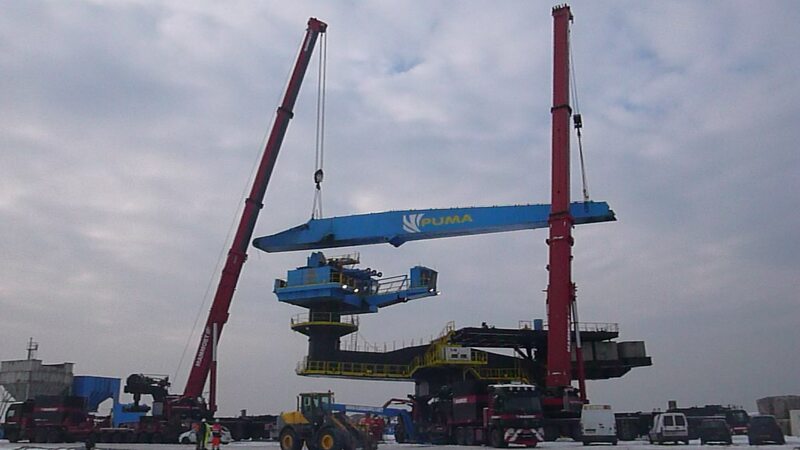 The original contractor, PUMA, used this E-Crane from 2011 through 2012 for the construction of a stone dune at the Port of Rotterdam, an important part of the hard sea defense which will protect Maasvlakte 2 from the sea and from extreme “10,000 year” storms. The Blockbuster is a specialized E-Crane with a lift capacity of 50 Mtons (55 UStons) and an outreach of 63m (207 ft) from the center of the machine. The Blockbuster placed approximately 20,000 individual large concrete blocks into the hard sea defense of Maasvlakte 2. Each block is 2,5 cubic meters (8.2 cubic feet) and weighs more than 40,000kg ( 88185 pounds). On January 30, 2012, the Rotterdam alderman, Jeannette Baljeu, placed the last block in the stone dune. After placing the last block, the Blockbuster’s work at the hard sea defense was complete. 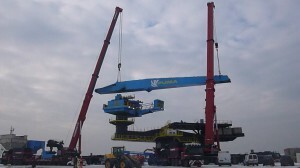 Next week, the E-Crane will be transported to the Caspian Sea. There, it will work on a new project for Saipem, an international contractor in oil and gas. The Blockbuster will have a second life and also a new name: Titan. The Blockbuster’s weight is approximately 1200 Mtons (1323 UStons). The counterweight at the back of the Blockbuster weighs around 360 Mtons (397 UStons). The Blockbuster has a height of about 30m (98 ft). The Blockbuster placed concrete blocks weighing more than 40.000kg (88185 pounds) with a positioning margin of no more than 15cm (6″). At full speed, the Blockbuster positioned around 15 concrete blocks per hour, most of which were below sea level.